This last one gave at least a hint of the changes involved as from its registration back in July 2013 licence PH1020951/199 was route number "GOLD". 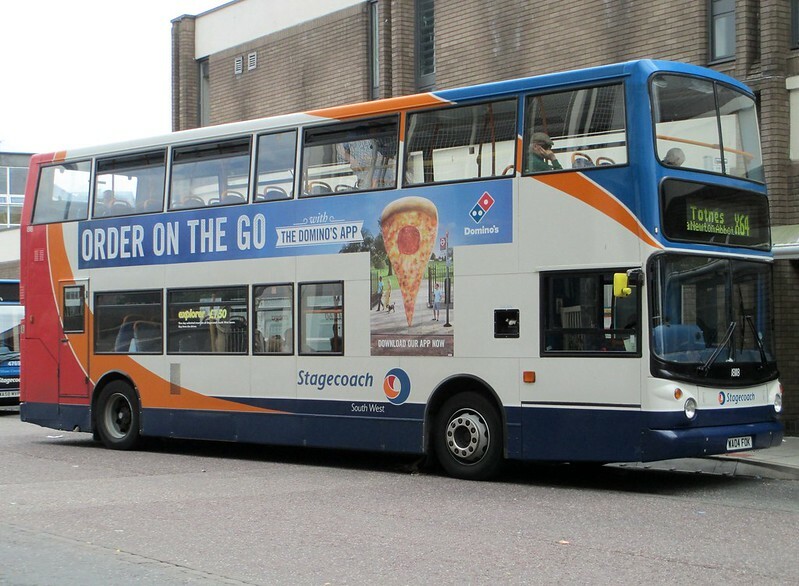 The Stagecoach spin does seem to underplay the scale of the reduction in buses serving Dartmouth. Previously Dartmouth saw weekday departures to Totnes at 0655, 0930 1030 1130 1230 1330 1430 1530 1635 1735 1850 2010. So what do they have now? Weekday departure from Dartmouth to Totnes (and beyond) are now 0618 0800 0925 1055 1255 1455 1655 1805 1905 1955. I guess its the last three departures which mean that Stagecoach can indeed claim a bus "up to every hour"! Railway Technology.com Fare's fair: does UK rail offer value for money? No surprise there then! The hourly Gold operation to Dartmouth was simply introduced by Stagecoach as a spoiling operation against First service X81 and successfully achieved its withdrawal. 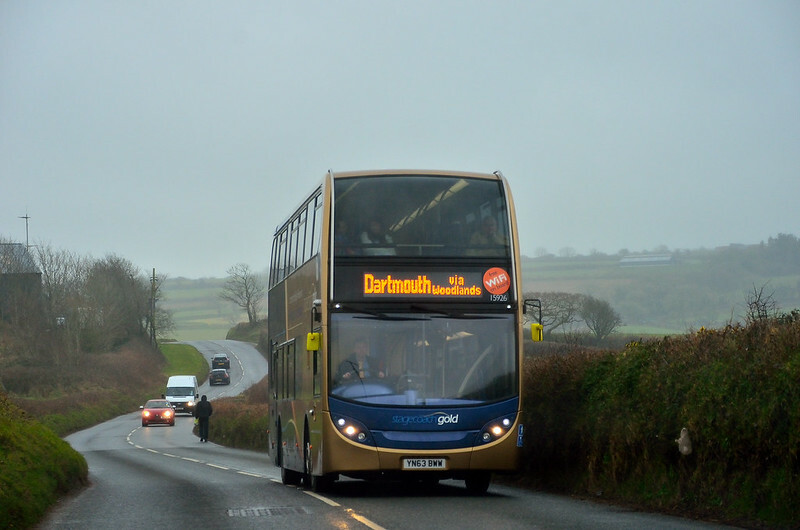 Having won that battle, in typical Stagecoach style, the Company is now cutting back to leave Dartmouth with a poorer service than it enjoyed with First! A level of service that First provided which wasn't needed, hence the reduction. You seem to have forgotten to mention that Stagecoach has doubled the former First frequency over the Torquay to Plymouth section. Oh yes, and with a consistent, high quality offering to boot.... in typical Stagecoach style. Actually it wasn't a spoiling operation at all as Stagecoach took over X80 and X81 without any competition from First as they wanted to withdraw and had been running it into the ground for ages. What is noticeable is that Stagecoach now run every 30 mins along whole route with high spec buses unlike First who ran clapped out buses and who said it wasn't even sustainable hourly without funding. I agree the cuts are regrettable but this is a commercial service and the demand levels simply aren't there (the passengers that do exist are mainly pensioners) and also it's not really suitable for Gold. 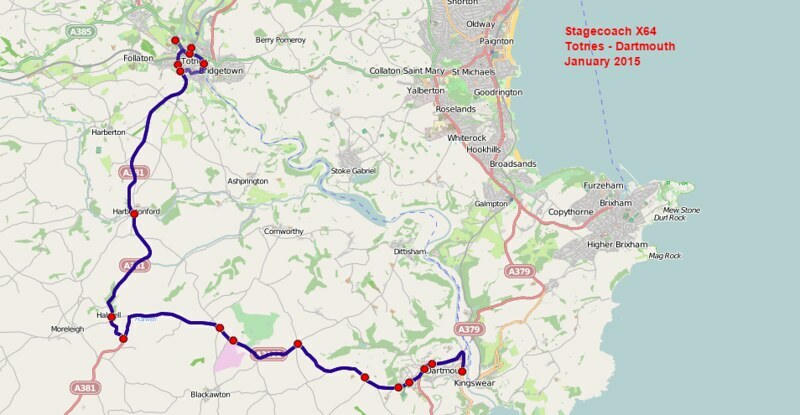 Also linking to Exeter makes more sense as Plymouth already has a Dartmouth link with the 93. Its ok to hate Stagecoach but to say Stagecoach West is effectively downgrade from First Plymouth is a joke. Just look at Exeter's buses that are smart, clean and mostly new or newish and compare to First with their confused multitude of liveries and identities and bringing in their idea of new buses...20+ years old and clapped out!!! Even if Stagecoach fail with Gold at least they tried where First failed. Stagecoach are not the lovely nice people they will have you believe, and that the uninformed bus enthusiasts persist in believing. They are an incredibly ruthless business, very aware of their costs and very adept at containing them. They are a poor employer of staff, over working them and discarding them when they cease to be of use to the company. Very nasty and ruthless people. There is a reason the back pages of the trade mags have frequent job adverts for Stagecoach companies. The Devon part of Stagecoach is actually "South West" - Stagecoach West is the former Bristol Omnibus operation of Cheltenham, Gloucester, Stroud and Swindon depots, although innovation, investment and constant improvement are very much to the fore here too. The fact that there is an improved frequency between Torquay and Plymouth is irrelevant to the operations between Totnes and Dartmouth. There is no evidence that First wanted to give up the X80/X81 operations but faced with the competition from Stagecoach took a pragmatic decision that the operations were not worth fighting over. The comment that the demand levels simply aren't there supports my contention that the initial hourly offering was a spoiling operation - not a commercial offering . First announced that they were 'almost in close-down mode' and Stagecoach, quite naturally, took the opportunity to re-enter that market. Anyone else would surely have done the same. It's a commercial market-place and if they hadn't done so, it's not unreasonable to suspect that Citybus would have looked at extending their Ivybridge service. However you look at it, the passengers have benefitted from Stagecoach providing new, consistant vehicles and a hugely improved frequency on the TQ - PH section and whilst I'm sure no-one really expected the Dartmouth leg to remain hourly, Stagecoach tried (for whatever reason you want to give) and passengers still have a reliable service and better vehicles. The mix of vehicles (many with worn-out seating) that First provided was wholly inadequate for such lengthy routes and the passengers deserved better. Stagecoach has an inkling that First were looking at the viability of the x80/x81 and took at a gamble and launched the GOLD service and were proved right when First withdrew. I was the first to like it when the K-LAE Leyland Olympians came out to play but they were certainly not user friendly in this day and age of disability awareness. South West have a strong RMT Union led by local officer Phil Bialyk and clamped down in driver diagram irregularities but all companies have to abide by government regulations regarding driving hours and breaks etc. South West are one of only a handful of bus companies who still have paid breaks and this will not let go by the RMT at all costs. Anywhere up and down the country, you'll have people who have 1 operator moaning about it wishing a different operator moved in, first were on shut down mode back then in fact they were running older buses on the the x80 then the heritage service between Totnes and Paington!! The x81 was never busy, half a dozen per trip at most and nearly all concension holders, except in the summer then you would have a fully loaded decker albeit again all concession holders (this is the nature of Torbay/South hams though) . Stagecoach registering the gold service when the first operation appeared to be shutting down is no different to first registering in cornwall on the apparent demise of western greyhound! Also similar to first registering routes in plymouth (ugobus) when they thought citybus was on the way out/up for sale. Exactly and let's not forget that the Stagecoach service may well only have been done under the GOLD brand because the buses happened to be available (they were ordered for Cambridge but that service launch had to be delayed). Had Stagecoach had to make do with older buses taken from wherever or even new normal-spec buses, First may not have been quite so spooked. We'll never know! Yes. People who moan at First do not realise how lucky they are that First have decided to stay and are now putting in a fight, Citybus/GA fares are already high, for example my bus pass is nearly half with First to what I would pay for equivalent Citybus one. Imagine how high their fares would be if First were not here competing. Long may it continue I say. Most towns and cities even bigger ones than Plymouth have just 1 main operator, Plymouth is fortunate to have 2 large companies. Even if Stagecoach had just gone with normal buses I am sure it have been welcomed with open arms by passengers who had been putting up with whatever tat First ran on it. As many people have pointed out, First was very much in shutdown mode and displayed all the signs of wanting to leave the area. First were struggling in North Devon yet SC were able to go in with decent new buses and make a success of it when First couldnt. The X80 is the same - SC bring in new buses and make it work, First couldnt / wouldnt. If the enthusiasts who would love to see a Go Ahead monopoly in Plymouth then they should go and visit parts of the Go South Coast operation where you will see older vehicles, sky high fares and lower service frequencies with evening/weekend subsidy of services by the council as there is no one else to operate the services so they charge what they please. Competition keeps the fares down, the services frequent, forces operators to innovate and forces operators to raise their game in their service provision. Monopolies are bad news for the customers. Go Ahead has no tolerance of competitors, and seeks to remove them in order to build and then abuse it's monopoly. I can't fully agree with Anon at 22:56 yesterday. Nine brand new high-spec double decks - later increased to 12 - seems a very expensive way of setting up a 'spoiling operation'. I think Anon at 09:17 has got it right. Citybus had already successfully got into Ivybridge, so perhaps Stagecoach thought that with First wobbling, Citybus might extend the 45 to Totnes or even Torquay if it didn't get in there first. Stagecoach are very savvy and will go where the traffic is. Clearly Plymouth has much more potential than Dartmouth so it made sense to increase the through service to there. 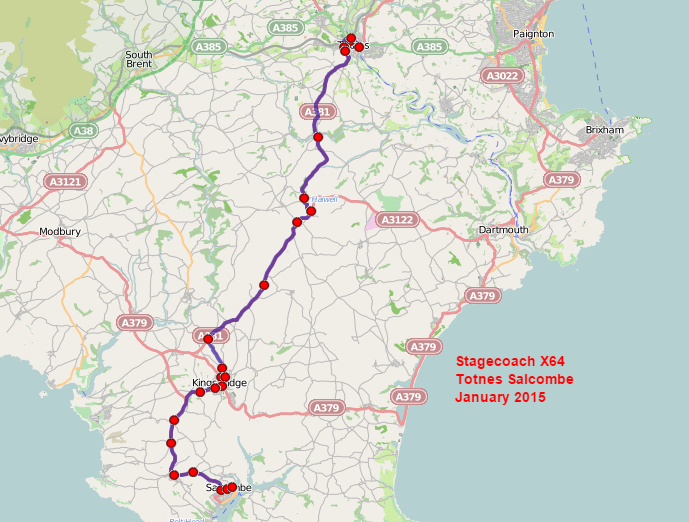 The fact that Stagecoach persisted with an hourly Gold service to Dartmouth - with a local loop round Totnes - is to its credit. I am not surprised that the Dartmouth service has been "deGolded" now - the first time this has happened? - but it can't reasonably be accused of not trying. 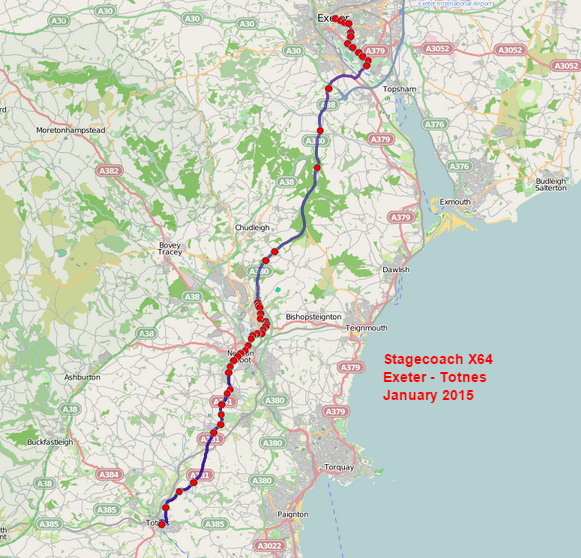 However, I would have preferred Stagecoach to regret that loadings have not been sufficient to justify an hourly service all day, and to have made a bit more of the new through service to Exeter. Anon..24/01/15 15:29 Glad to see a sensible comment on this subject, I am absolutely baffled by the First bashers and Go Ahead are wonderful comments. Go Ahead fares in Plymouth are way more expensive than First and they have been forced to drop fares only on corridors where they have met stiff competition from a much cheaper First service..as customers deserted them in numbers to the competition. Lets be fair they would not have dropped these fares if their profit margins were not taking a hit!. I am sure people would be paying even more if GA had Plymouth monoploy. Where GA have monopoly they have by far the most expensive fares in comprison to First and Stagecoach, be warned. And your evidence for this sweeping statement is? If you are going to bash any operator please have the courtesy to back your statements with actual evidence. Not saying you are wrong but you need to justify such a sweeping statement with facts. All I will say to the suggestion that Go-Ahead do not tolerate competitors is that certainly was not the case in Crawley. Metrobus were quite happy to leave Crawley Reds alone and to even stock copies of their timetable booklets in the Travel Shop.